This week, Harrison Ford spoke with the BBC about the 5th Indiana Jones Film. This is the exact quote. Steven and George and I are sort of agreed on a germ of an idea and we’re seeing what comes of it. After seeing Indiana Jones and the Evil Communist Alien Hunters, I have to assume that “germ” Ford mentioned is actually the beginning of a sinister bacterial disease that will fester and consume all things in it’s path or, at the very least, will give you a painful rash and digestive problems. The process works like this: We come to some basic agreement and then George goes away for a long time and works on it. Then Steven and I get it in some form, some embryonic form. Then if we like it we start working with George on it and at some point down the line it’s ready and we do it. See, the way Harrison is describing it now, it is less bacterial and more of a mutant spawn baby that will take another bite out of the childlike wonder I have for the Indiana Jones series. I could be exaggerating. That is possible. But I had hope when I walked into the theater to watch Indy 4. I knew Lucas’ record was not great in the last ten years, but it was Indiana Jones. How can you ruin Indy? He found a way, folks. And unless we get a miracle, it all goes down hill from here. 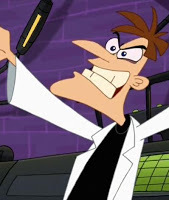 Next Article The Phineas and Ferb Movie! Can I boycott this film with you? Hey, I say we at least give it a chance. I mean, despite the fest of FAIL that was Indiana Jones and the Kingdom of Mulder and Scully, The great Harrison Ford was still Indiana Jones after 20 years.